I am very pleased to announce the official launch of the newly redesigned corporate website, for TimePayment. I redesigned the company's website in partnership with Sebastian Zapisek of BuroKraft. The new website was designed with TimePayment's audience segments in mind, focusing our inbound efforts of the direct lessee / consumer. The website is loaded with new tools and resources that are easily accessible with improved responsive-design navigation and UX. In addition, the Marketo-integrated lead capture forms with progressive-profiling capabilities will help the company build and nuture their sales pipeline with integrated campaigns, tracking, and reporting. I knew that the #1 question from potential lessees who were not quite ready to apply for financing were looking for a quick and easy way to estimate their potential monthly payment BEFORE they applied for financing. Now they can, thanks to this new custom QuickQuote Tool. 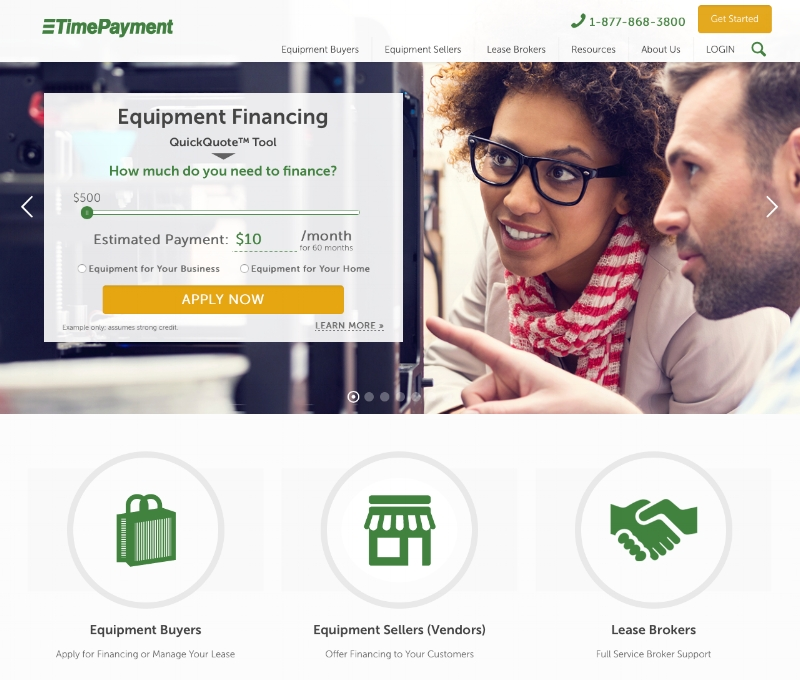 TimePayment offers authorized dealers (equipment vendors and lease brokers) free online sales tools to help these partners sell more online by offering their customers equipment financing through TimePayment. I wanted to showcase the tools offered, and make understanding them and comparing features easy for the users. The new testimonials page showcases real vendor, brokers, and lessees across a variety of industries to showcase the breadth of TimePayment's experience. I have sprear-headed the content strategy at TimePayment, and now they offer a large variety of content for buyers, brokers, and vendors. The new and improved blog design makes browsing the content quick and easy.